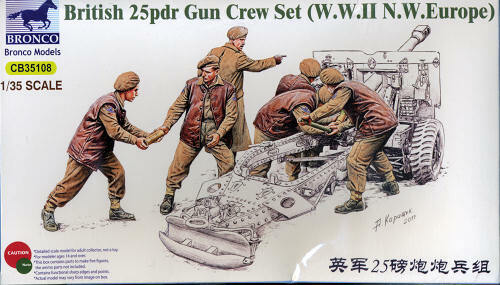 This latest figure set from Bronco is for a crew on a British 25pnd field gun during 1944/45. The set includes six figures, which seems almost the norm for Bronco. It has a gun commander, an aimer, a loader, a man who shoves the shell in the breech and closes it as well as two ammunition handlers. One of the more unusual things about this kit as compared to others is that it comes with decals. These are not for the gun per se, but insignia and badges for the crew. 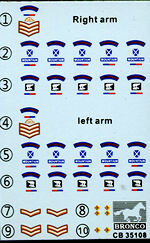 There are two different units available in the badges, though neither is identified. The sheet is well printed and the back of the box not only contains the painting guide, but also the decal placement guide for each of the six figures. Like all Bronco figures, these are very well molded with the appropriate clothing for the period. Full building and painting instructions are included, and the different poses provided make it a most useful set.